At the same time, in Glendale, Tina was slipping into Edward’s studio, past its trailing ivy and morning glories. The preceding weeks has offered few opportunities for trysts, leaving her suspended between heaven and earth. Perhaps it was as she arrived, collar rolled up against the cutting cold, that Edward turned his camera upon her for a portrait. 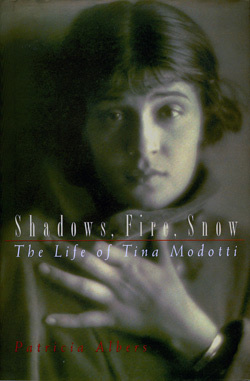 One wrist encircled by Myrto’s silver bracelet, Tina clutches at the fastenings of her coat as if gathering herself up in a flush of breathless timidity before the self-forgetful ardor of the coming moments. Tina abandoned themes of flowers and architecture to focus on the soulful and heroic qualities of the Mexican masses. She fixed her lens upon the sun-raked, dust-whipped, harshly beautiful lives of laborers and campesinos. Many Modotti photographs reveal a complicity between the photographer and her subjects, viewed not only as individuals but also as representative of a time and a people. … Mexican workers conjoined with their tools and burdens became a favorite theme. Tina shot a silent, tattered bakery boy, a wide bread basket appended to his head, and a day laborer so encumbered by his load that he appears to be nothing more than legs for a bundle of boards. Along her sidewalks hobble a dark, crooked woman, somehow eking out a living from the mound of sticks on her back, and a striped-shirted plant seller who balances his wares like an extravagant topknot.